To enforce bandwidth availability, it is possible to reserve a portion of the available uplink bandwidth using Network I/O Control (NIOC). It may be necessary to configure bandwidth reservations to meet business requirements with regards to network resources availability. In the system traffic overview, under the resource allocation option in the Distributed vSwitch settings, you can configure reservations. Reservations are set per system traffic type or per VM. Strongly depending on your IT architecture, it could make sense to reserve bandwidth for specific business critical workload, vSAN network or IP storage network backend. However, be aware that network bandwidth allocated in a reservation cannot be consumed by other network traffic types. Even when a reservation is not used to the fullest, NIOC does not redistribute the capacity to the bandwidth pool that is accessible to different network traffic types or network resource pools. Since you cannot overcommit bandwidth reservations by default, it means you should be careful when applying reservations to ensure no bandwidth is gone to waste. Thoroughly think through the minimal amount of reservation that you are required to guarantee for network traffic types. For NIOC to be able to guarantee bandwidth for all system traffic types, you can only reserve up to 75% of the bandwidth relative to the minimum link speed of the uplink interfaces. When configuring a reservation, it guarantees network bandwidth for that network traffic type or VM. It is the minimum amount of bandwidth that is accessible. Unlike limits, a network resource can burst beyond the configured value for its bandwidth reservation, as it doesn’t state a maximum consumable amount of bandwidth. You cannot exceed the value of the maximum reservation allowed. It will always keep aside 25% bandwidth per physical uplink to ensure the basic ESXi network necessities like Management traffic. 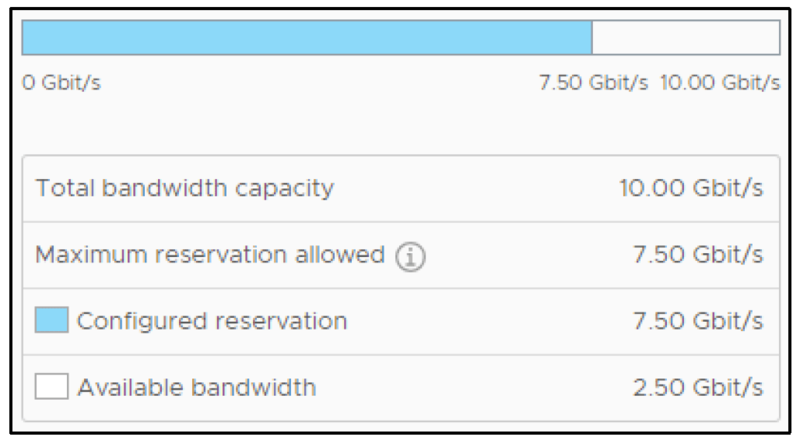 As seen in the screenshot above, a 10GbE network adapter can only be configured with reservations up to 7.5 Gbit/s.